The round opens today and closes on 9 May 2016. Thank you to our volunteer guides Phil and Ilona who took on this project! 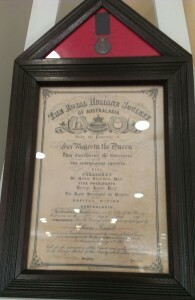 This month’s featured artwork from the RHSQ’s collection is a framed certificate and bronze medal from the Royal Humane Society of Australasia, awarded to William Russell of Lowood on 19 May 1893 for his bravery. On 4 February 1893, Russell and three Queensland Defence Force personnel risked their lives to rescue the Vernor family from flood waters in Cluen, near Lowood. This story and the artefact are on display at the Commissariat Store reception area for the month of March. During early February 1893, floods occurred in Queensland after a continuous downpour for 14 days which was worsened by tropical cyclone, Bundinyong. During this flood which is referred to as the Black February Floods, 35 deaths were recorded, 300 people injured and 5000 people lost their homes. On the 4th February 1893 a resident of Lowood, Mr William Russell, along with three Queensland Defence Force members risked their lives to gallantly rescue the Vernor family, residents of Cluen, who were stranded in the flood. Captain Robert Vernor and his family were attempting to escape their flooded home in a boat when their vessel capsized in the dangerous floodwater after striking a tree. The Vernor family sought refuge in the top of a gum tree. Mr William Russell, who had considerable experience with the Brisbane River from his younger days, was residing in Lowood as a result of floodwater threatening his family home. He immediately volunteered to rescue the Vernor family after receiving word. Major J. Flewell-Smith and his brother Malcolm also volunteered to help the family. Mr Arthur Nunn and Mr E.C Nunn travelled three miles up the river and obtained two dinghies which were owned by Mr G. F Chapman and Arthur Nunn. The dinghies were taken back down the river to Lowood in which Major Flewell-Smith and his brother manned one dinghy, and Mr William Russell and Mr E Nunn manned the other. The dinghies left from below the Lowood sawmills and had to dodge the tops of trees and debris on the Vernor property. They passed the Vernor house in which only 3ft of the roof was showing above the floodwaters. The party proceeded to travel further down the river in which they found eight people perched up in trees. Seven members of the Vernor family and an orphaned boy had been stuck there for the previous 24 hours. The Vernor family had tied themselves to the tree using whatever clothing they could, as the floodwater continued to rise. Mr Russell manoeuvred the dinghy next to the other dinghy and close enough for the Vernor family to flee into the vessel. A rope was passed to Mr Jim Vernor who was stuck on an outer limb of the tree, who was hauled through the floodwater to the safety of the dinghy. The two vessels separated to travel back up the river full of debris and whirlpools. They arrived on land about three miles from where the party had left from. On the 19th May 1893 the Governor of Queensland, Sir Henry Wylie Norman visited Lowood and presented the rescuers with certificates from the Royal Humane Society of Australasia and bronze medals for their bravery. A Flood Incident. (1893, March 10). The Week, p. 14. Allen, W. (1895, July 23). Brave Soldiers: Saving the Vernor Family. (1893, March 6). The Telegraph, p. 6. Postal Arrangements. (1893, March 6). The Brisbane Courier, p. 4. Royal Humane Society of Australasia. (1893, May 19). The Argus, p. 3. 1893 Flood Rescue at Lowood Recalled. (1950, March 3). Queensland Times (Ipswich), p. 2. The Australian Government has released the final report of the independent review of the Protection of Movable Cultural Heritage Act 1986. The review, conducted by Mr Shane Simpson AM, Borders of Culture: Review of the Protection of Movable Cultural Heritage Act 1986 was provided to the Government on 30 September 2015. The Act, which has not been substantially amended since its enactment more than 25 years ago, regulates the export of objects that are significant to our history. It also plays an important role in protecting Australia’s cultural heritage by assisting collecting institutions to acquire significant cultural material and provides for the return of foreign cultural property which has been illegally exported from its country of origin. For more information about the review of the Act or to read the final report, Borders of Culture: Review of the Protection of Movable Cultural Heritage Act 1986 visit the Ministry for the Arts website http://arts.gov.au/movable. Read the full Final report for review of Protection of Movable Cultural Heritage Act 1986 media release. National Gallery of Australia, Canberra, Gift of Sunday Reed 1977. The President of The Royal Historical Society of Queensland (RHSQ), Mr Dean Prangley, has welcomed the Federal Government’s listing of the Burke and Wills 1860-1861 expedition sites onto the National Heritage Register. The National Heritage listing comprises five important sites along the banks of the Cooper Creek, near Innamincka, that represent key locations for the ill-fated expedition into inland Australia. One of these sites, known as the Dig Tree at Cooper Creek, is where expedition members established a base camp, buried supplies and left markings and messages for each other. Mr Prangley said the Dig Tree had long been considered a national treasure. “The listing of the Dig Tree on the National Heritage Register further highlights the importance of the site as part of Australia’s cultural heritage,” he said. The Dig Tree reserve had previously been known as Depot Camp 65 for the 1860-61 Burke and Wills expedition from Melbourne to the Gulf of Carpentaria, with the expedition contributing to the opening up of the Australian inland to pastoralism. Explorers Robert O’Hara Burke and William John Wills completed the first north-south crossing of the Australian continent, but died during their return journey. Situated on the southern bank of the Boolloo Boolloo waterhole at Cooper Creek via Thargomindah, the Dig Tree is a mature Coolabah believed to be 200 to 250 years old. A reserve was created in 1964 as a means of protecting the Dig Tree and the RHSQ was appointed Trustee of the site. The Dig Tree reserve was listed on the Queensland Heritage Register in February 2003. Mr Prangley said this month the RHSQ would review an updated Conservation Management Plan (CMP) prepared for the site, which was made possible with a grant from the Queensland Department of Environment and Heritage Protection. “The CMP will allow us to examine a number of important issues aimed at working closely with the Bullo Shire Council, the Burke & Wills Historical Society, Santos and other key stakeholders to improve the management, interpretation and protection of the site to accommodate the growing number of tourists,” he said. Media Contact: Ms Helen Brackin, Manager, RHSQ – Telephone 07 3221 4198. In May 1825 Lieutenant Henry Miller, the First Commandant of the Moreton Bay Penal Settlement landed on the North Bank of the Brisbane River somewhere near the present location of the Victoria Bridge and founded the site of the City of Brisbane. The Royal Historical Society of Queensland will celebrate this occasion on Wednesday the 13th of May which will showcase a talk on the “Lost Brisbane” book and lectures on the founding of Brisbane. It is intended to celebrate this day each year up to Brisbane’s 200 year anniversary in 2025. For more information, see the attached media statement.